JETAA (Qld) Inc.: Newly elected committee members of 2016! Newly elected committee members of 2016! Congratulations to the newly elected committee members of 2016! 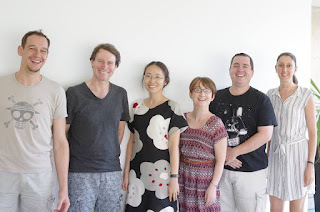 From left to right: Olivier Allart (vice president), Richard Wilding (president), Pui Ki Lau (webmaster), Ellen Burgess (newsletter editor), Brett Middleton (treasurer), Laura Massingham (general committee member). Jasmin Lamsing is the secretary.